Last week the first baby boomer applied for social security. People may play politics all they want but the iron laws of mathematics cannot be toyed with. In the next decades more money will go out of the social security fund than comes in. Much more. If the politicians can't make provisions now, then how will they ever be able to do it in the future? We need to note that the Democrats in particular have blocked any reforms. They may become known in history as the party that created social security in the twentieth century and destroyed it in the twenty-first century. 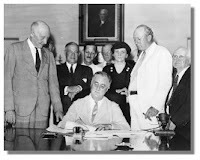 Pictured: President Franklin D. Roosevelt signs the Social Security Act on August 14, 1935.